I put them in a question and answer format. Hope it helps! What are the pats of the male urethra? 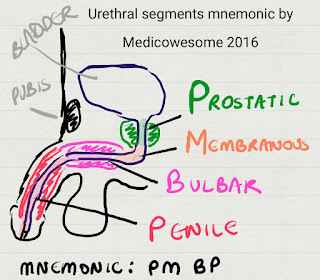 The male urethra is anatomically subdivided into anterior and posterior segments at the level of the urogenital diaphragm. Some classifications also divide the penile urethra (Also known as spongy urethra) into pendulous urethra and fossa navicularis. Another extra subdivision is pre-prostatic urethra. In which conditions does posterior urethral injury occur? Posterior urethral injury usually occurs in close proximity to the external (ie, voluntary) urethral sphincter mechanism, and is usually initiated by a massive shearing force that results in pelvic fracture and disruption through the membranous urethra. The pelvic fractures that lead to urethral disruption are usually secondary to motor-vehicle accidents (68%–84%) or falls from heights and pelvic crush injuries (6%–25%). Why is the membranous urethra so susceptible to injury? The membranous urethra is approximately 1 to 1.5 cm long, extending between the prostatic apex and the proximal corpus spongiosum. 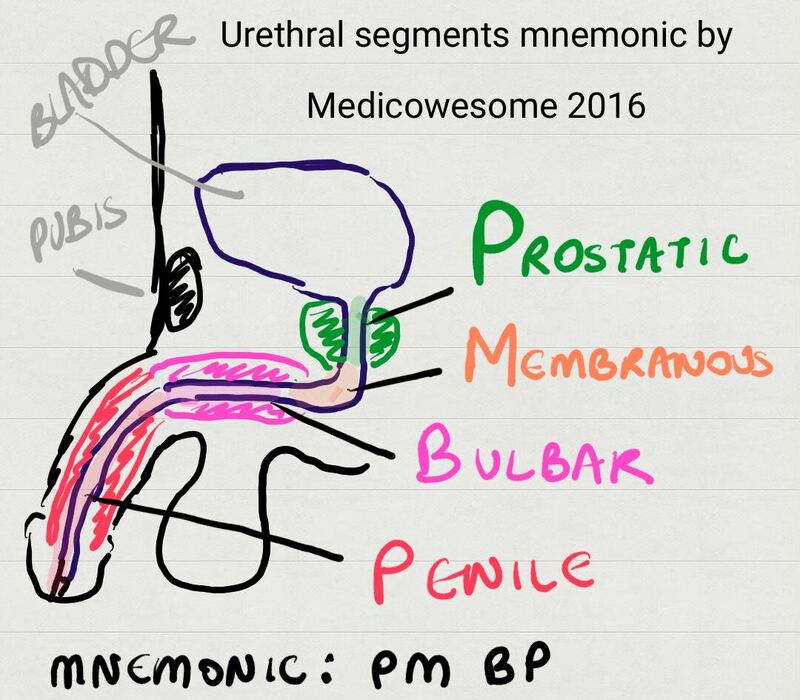 The membranous urethra is the only segment of the urethra that is unprotected by surrounding spongy tissue or prostatic stroma, and is thus more susceptible to external trauma. What are the signs and symptoms of posterior urethral injury? Blood at the meatus is a cardinal sign of posterior urethral injury, and is seen in 37% to 93% of cases. A palpably distended bladder or inability to void, perineal bruising, and perineal ecchymosis are all suggestive of urethral disruption. Digital rectal exam may disclose an elevated or displaced prostate gland ("High riding prostate"). The triad of pelvic fracture, blood at the meatus, and inability to void are diagnostic of prostatomembranous urethral disruption. In which conditions does anterior urethral injury occur? Examples of anterior urethral injuries include straddle trauma crushing the immobile bulbous urethra against the pubic rami, or a rupture of the corporal bodies (eg, penile fracture), leading to a laceration through the adjacent urethra. Why is the bulbar urethra so susceptible to injury? The bulbous urethra is the most frequently injured segment (85%) because it is fixed beneath the pubic bone, unlike the freely mobile pendulous, penile urethra. Blunt injuries to the bulbous urethra are typically caused by straddle type injuries (eg, motor-vehicle accidents; bicycle accidents; falling astride onto a fence, railing or saddle) or kicks to the perineum. The force contacting the perineum crushes the bulbous urethra up against the inferior pubic rami, leading to contusion or urethral laceration. What are the signs and symptoms of anterior urethral injury? Blood at the meatus is once again the cardinal sign of anterior urethral injury. Dysuria, hematuria, and inability to void are all strongly suggestive of urethral injury. A significant perineal hematoma will be present if the injury has disrupted Buck’s fascia and tracks deep to Colles’ fascia, creating a characteristic ‘‘butterfly’’ hematoma in the perineum. This occurs in severe straddle injuries. Suspected urethral injury on clinical examination, next best step in the diagnosis? The diagnostic study of choice is retrograde urethrography (RUG), and the threshold for performing it in the setting of suspected urethral injury should be low. What is contradicted in suspected urethral injury? Urethral catheterization attempts in the presence of the findings suggestive of urethral injury (Discussed above) are contraindicated before diagnostic retrograde urethrography. Converting a partial urethral rupture to a complete tear. If questions is asked urethral rupture is above deep perineal pouch ,then collection of urine will be where?A-medial aspect of thigh.b-scrotum.c-true pelvis only.d-ant abd wall.